Campers at last year's Quo Vadis retreat enjoy ice cream together. 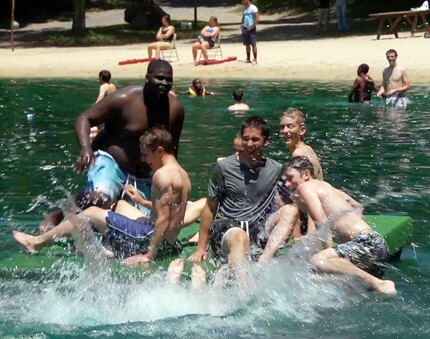 Swimming at Black Rock Retreat Center is just one of the fun activities at the Quo Vadis retreat. 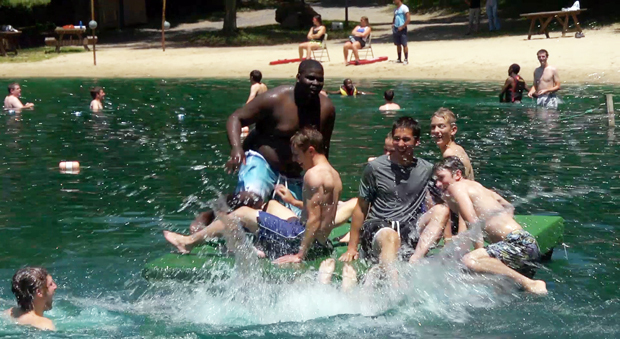 Quo Vadis means “where are you going?” This summer about 150 boys in high school, or June grads, know they’ll be going on a four-day Quo Vadis retreat at the Black Rock Retreat Center in Lancaster County, but perhaps later, St. Charles Borromeo Seminary. Who knows? The retreat will be held in two sessions, either July 5-8 or July 9-12, and is sponsored by the archdiocesan Vocation Office for the Diocesan Priesthood. In its seventh year Quo Vadis has grown from 19 participants two years ago to 101 and the hoped for 150 this year, based on indications of interest, according to Father Stephen DeLacy, the director of the Vocations Office. Black Rock, a Christian retreat center, can be quite a draw. The teens are broken down into small groups which promotes building relationships; there is the opportunity for daily Mass, there is rosary and exposure to the Liturgy of the Hours and inspirational speakers. The leadership team consists of about 30 priests, seminarians, lay leaders and women among the chaperones. As to who signs up for the retreat, based on experience a significant number are home-schooled and the biggest group is from public schools, with only a minority from the Catholic high schools, according to Father DeLacy. That is something his office is working to change. Ethnically there are a fair number of African Americans and Africans thanks to the work of Deacon Bill Bradley at the Office for Black Catholics and Matt Davis at the Office for Pastoral Care of Migrants and Refugees, as well as Hispanics, Filipinos and other Asians, Father DeLacy said. Most teens who attend the Quo Vadis retreat on surveys indicate they would do it again. “They especially like the food; it is in Amish country with plenty of fresh foods and they enjoy the bonding experience, the faith formation and just having fun,” Father DeLacy said. In addition to the upcoming Quo Vadis retreats Father DeLacy’s office just conducted a “Forged by the Fire Alive” retreat for men between the ages of 18 and 25, also at Black Rock. The retreat attended by 12 young men went much deeper on the spiritual side. The main speaker was Father Thomas Daily, an Oblate of St. Francis de Sales who is on the faculty of De Sales University and holds the Cardinal John Foley Chair of Social Communications and Homiletics at St. Charles Seminary. Just how effective the retreats are in supporting vocations may be proved by the numbers. This year, Father DeLacy estimates half of the men going into the college program at St. Charles did attend Quo Vadis retreats. He estimates there may be as many as 21 men entering the seminary this year, which is a fair increase from the recent past. As to the cost of the four-day Quo Vadis retreat Father DeLacy estimates it around $300, but most of that is covered by fundraising, especially by the Serra Clubs and a grant from the Archdiocesan Educational Fund. “The kids are only charged $20; we don’t want to take their money but we want them to be invested in it,” Father DeLacy said. See registration information for the Quo Vadis retreats. Father Stephen DeLacy leads the young men in prayer at the 2014 Quo Vadis retreat.